Yet another harbinger of corporate news media’s continued demise is evident when a familiar mainstream journalist with admitted ties to US intelligence agencies plays covert roles in the issues and events he claims to report objectively on. The case of Kurt Eichenwald suggests how the CIA’s famous Operation Mockingbird is alive and well in the twenty-first century. In the query, one of thousands of emails produced by FAU during discovery, the fiercely partisan Eichenberg more than subtly pressures the FAU administration on Tracy’s public speech concerning the Sandy Hook massacre event, further suggesting that Tracy is mentally ill, guilty of criminal harassment, and may pose a legal liability to the university. Eichenwald’s email was received by the university’s chief public affairs officer and immediately forwarded to FAU President John Kelly, General Counsel David Kian, and Provost Gary Perry. Perry forwarded the email to Associate General Counsel Lawrence Glick and Vice Provost Diane Alperin. Less than 24 hours thereafter Alperin informed this author he would be fired. By Louis Leo IV Esq. In 2016, former Florida Atlantic University (“FAU”) Professor James Tracy filed a civil rights lawsuit against FAU following the termination of his tenured employment. If one relies on mainstream press reports of his firing they may conclude the action was justified because of Tracy’s alleged “harassment” of Sandy Hook parents, and/or his failure to comply with the school’s “outside activities” policy. Yet at its heart, Tracy’s case has grave implications for the First Amendment rights of virtually every US academic and government employee. Through their own repeated admissions FAU administrators justified Tracy’s termination by arguing that Tracy failed to “disclose” his constitutionally protected political speech for university approval under a vague and confusing school policy. If this precedent stands unchallenged it will allow virtually any government agency to police employees’ extracurricular speech or political activities, and accordingly discipline workers whose views are deemed objectionable. What do you know about the James Tracy case? If you get your news and information from “mainstream” media outlets and their affiliates and partners in fake news around the globe, you probably know nothing about the case. Or if anything, you might think you know some crazy teacher said nobody died at Sandy Hook Elementary School, and lost his job. So what? Well, if you think Professor Tracy is crazy, or was out of line in his blog postings about Sandy Hook, Tracy is far from alone in casting doubt about the official story. In fact, 24% of Americans surveyed in 2016 acknowledged the massacre may have been faked to promote gun control—a number which will undoubtedly grow as more and more Americans discover the vastly censored body of research and documentaries like “We Need To Talk About Sandy Hook”. Notwithstanding the truth about Sandy Hook, or other government conspiracies, what if I told you that Professor Tracy didn’t do anything wrong? What if I told you that government officials at FAU broke their own rules, and the First Amendment when they disciplined Professor Tracy? For those who don’t care about freedom of speech, you need read no further. For those who understand and appreciate the fact that FAU, a major American public university, isn’t the NFL, and that its government officials aren’t allowed to conspire to beat the First Amendment and fire a government employee because of what they say as a private citizen about a matter of public concern, please keep reading. Professor James Tracy, who has a Ph.D. in mass communications, was an award-winning, tenured communications professor at a government-run university. He was a good teacher who received outstanding and excellent annual evaluations from his supervisors while teaching at FAU for over a decade. Don’t take my word for it. Read his FAU performance evaluations. William Penn Jones Jr. was an American journalist, the editor of the Midlothian Mirror and author. He was also one of the earliest John F. Kennedy assassination conspiracy theorists. Jones attended the University of Texas at Austin and was a classmate of Henry Wade and John Connally. Wade later become the District Attorney in Dallas while Connolly would later become the 39th Governor of Texas. Both men were figures in the assassination of JFK. In 1946, Jones purchased the Midlothian Mirror for $4,000; he eventually sold the newspaper in 1974. In 1963, Penn received the Elijah Lovejoy Award for Courage in Journalism. Jones was also known for being an early critic of the Warren Commission‘s report on the assassination of JFK. In 1967, he self-published Forgive My Grief, a four-volume work on the assassination of President Kennedy. In the 1980s, Jones co-edited The Continuing Inquiry newsletter with Gary Mack of the Sixth Floor Museum at Dealey Plaza. On January 25, 1998, Jones died of Alzheimer’s disease in a Alvarado, Texas nursing home at the age of 83. In January 1983 Rebel Magazine published an article written by Jones, which is republished in full, with no editing below (except images). 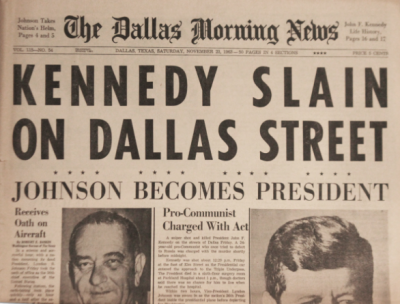 The JFK assassination was one of the biggest events to have ever hit America and Jones assumes that the reader of the time would have known quite a bit about it. This article makes for fascinating reading whether you believe the official state narrative or alternative theories. Last October, Statista concluded from surveys that 61 percent of Americans believe JFK was not killed by Oswald alone and that others were involved. Over 100 murders, suicides, mysterious deaths – the strange fate of those who saw Kennedy shot. Shortly after dark on Sunday night November 24, 1963, after Ruby had killed Lee Harvey Oswald, a meeting took place in Jack Ruby’s apartment in Oak Cliff, a suburb of Dallas, Texas. Five persons were present. George Senator and Attorney Tom Howard were present and having a drink in the apartment when two newsmen arrived. The newsmen were Bill Hunter of the Long Beach California Press Telegram, and Jim Koethe of the Dallas Times Herald. Attorney C.A. Droby of Dallas arranged the meeting for the two newsmen. Jim Martin, a close friend of George Senator’s, was also present at the apartment meeting. Bill Hunter, a native of Dallas and an award winning newsman in Long Beach, was on duty and reading a book in the police station called “Public Safety Building.” Two policemen going off duty came into the press room, and one policeman shot Hunter through the heart at a range officially ruled to be “no more than three feet.” The policeman said he dropped his gun, and it fired as he picked it up, but the angle of the bullet caused him to change his story. He finally said he was playing a game of quick draw with his fellow officer. The other officer testified he had his back turned when the shooting took place. Hunter was quoting Tom Howard who died of a heart attack in Dallas a few months after Hunter’s own death. Lawyer Tom Howard was observed acting strangely to his friends two days before his death. Howard was taken to the hospital by a “friend” according to the newspapers. No autopsy was performed. censorshipconspiracy researchgovernment conspiracyintelligenceJFKKennedy assassinationRebel Magazinestate crimeWilliam Penn Jones Jr.
Editor’s Note: University professors in the United States today seldom engage in public speech that may even remotely threaten their employment. This is partly due to the fact that close to three-quarters of teaching faculty are non-tenured contract workers, and thus readily recognize their lack of tenure protections. Yet the many who have earned tenure regard it as more of a guaranteed sinecure than a guard against potential administrative retaliation for personal beliefs and/or public statements. In fact, the institution of tenure in American higher education is largely rooted in the controversy surrounding Stanford University’s dismissal of Professor Edward A. Ross in 1900 for his public speech. Ross was a highly-regarded economist, sociologist, and even an early mass media critic. Jane Stanford, widow of railroad magnate and university founder Leland Stanford, was disturbed by Professor Ross’ political views, evident in the popular faculty member’s enthusiastic public support of the Populist Party’s “free silver” platform of the 1890s, and his subsequent condemnation of “Chinese cheap labor.” Following these remarks Ms. Stanford successfully pressured university president David Starr Jordan to terminate Ross’ employment. The retaliatory firing of Ross became known as the “Ross case” and is historically recognized as a principal motivating factor in Professors John Dewey and Arthur O. Lovejoy’s founding of the American Association of University Professors that advocated for tenure across the US higher ed landscape. In 1900, Jane Stanford forced out a respected faculty member. Was he a martyr to academic freedom or a racist gadfly who deserved what he got? ON A TUESDAY AFTERNOON in November 1900, Edward Alsworth Ross gathered several student reporters in his campus office. Ross, 33 years old and a Stanford economics professor of seven years, had joined the university just two years after its opening. He was a captivating sight, 6-foot-5 and nattily dressed in a suit that favored his athletic physique. Ross was popular with students and esteemed in his field. David Starr Jordan, the university’s first president, had recruited him not once but twice. Plucked from Jordan’s former home at Cornell, Ross was emerging as a scholarly star. Now, his time at Stanford was coming to an abrupt end. Ross held a lengthy written statement he had prepared for the San Francisco newspapers. He handed it to the students. ONE HUNDRED AND FIFTEEN YEARS LATER, the reasons for Ross’s departure remain in dispute. The matter was precipitated by a series of public pronouncements Ross had made on political matters between 1896 and 1900, a practice that put him at odds with university co-founder Jane Stanford. Was he forced out because of his outspoken opinions or because he broke rules prohibiting partisan advocacy? What is not in dispute is that Mrs. Stanford insisted that Ross be sacked despite the vigorous objections of Jordan, who finally relented. Ross’s dismissal drove a wedge between Stanford faculty and the administration and resulted in a spate of resignations by other professors. More broadly, it galvanized efforts to codify protection of academic freedom and indirectly led to the establishment of tenure. As it turned out, that hastily arranged press conference in Ross’s office was a seminal moment in the history of higher education. LONG BEFORE HIS NAME became synonymous with academic freedom controversies, Edward Ross was an enigmatic figure. Born to a farmer and a schoolteacher in Illinois, and orphaned at age 10, he was taken in by neighbors on a nearby Iowa farm. His new family viewed him as a prodigy, praising him so extravagantly that some boys in the area thought him pampered.